The aim of "Classrooms for Kenya" is simply to provide permanent, safe classrooms for Kenyan children living in poor rural areas. 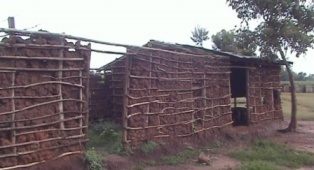 Classrooms for Kenya was established in 2006 by teachers and students at The Weald School, West Sussex. After visiting the country we were shocked by the standard of the buildings many children were learning in. These buildings were commonly made from mud and expected to collapse within a few years of construction but they were simply the only buildings the Kenyan schools could afford to build. After our visit we decided to offer our help by raising the funds to build permanent classrooms between different schools in western Kenya and to send our Sixth Form students to help build these rooms. The new, permanent classrooms that we have been building are giving children in Kenya the opportunity to learn in a safe, non-crowded environment. This was a typical classroom at Lumuli Primary School, a school that the Kenyan Government was going to close until it received our help. Lumuli Primary School has been completely rebuilt, partly due to the efforts of Classrooms for Kenya. Our work does not stop here. There are still children who are learning in unsafe mud huts. The Kenyan education system operates a policy where the cost of any new buildings must be met by parents. The parents that we met simply cannot afford to pay for these buildings. We are looking to raise the funds to rebuild as many schools as possible in western Kenya but we will need all the help we can get. This area of Kenya is particularly poor and does not receive the sort of publicity or funding that Nairobi or other cities do. The only way schools can provide safe facilities for their children is with our help. Furthermore, these classrooms will not only be used for basic education but will also be used for teaching about AIDS awareness, equal opportunities for women and other issues that affect the community. This classroom was built for Lumuli Primary School and is typical of the classrooms built by our charity in Kenya so far. Since 2006 we have built over 70 classrooms in 20 different schools. Every year, Classrooms for Kenya aims to build at least 4 new classrooms for the safe education of Kenyan children.